The written word is a magical thing to behold, and there is nothing more magical and amazing than a fairy tale and its retellings. The world and magic of fairy tales permeates most works of literature these days. Folk and fairy tales, as the beginnings of story telling along with the myths of the ancients began as an oral tradition. 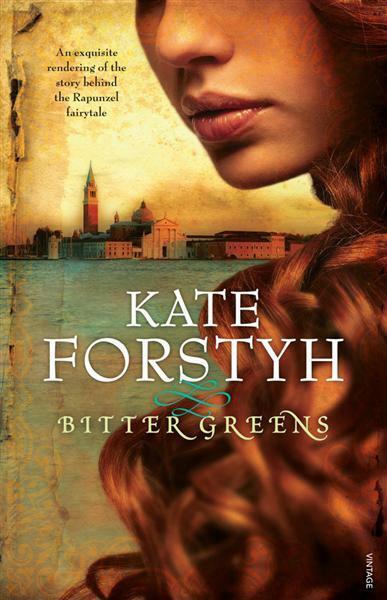 Some books have carried on this tradition and one is Bitter Greens by Kate Forsyth, published in 2012. Though a literary work, it has the feel of a tale that could be told by a campfire orally without referring to the page, and this magic about the story is something that I loved. Set in Renaissance France, it tells the story of Charlotte-Rose de la Force, a member of the court of the Sun king, Louis XIV, and the time she spent there as a young woman, and her eventual exile to a convent. Here, she is told the story by one of the nuns, Soeur Seraphina of a young girl a century before, locked away in a tower. Margherita lives in Venice one hundred years before, leading a happy life until she is taken away, and sold by her parents for a handful of bitter greens. She is alone in the world until somebody hears her singing, and comes to see what the sound is. When Margherita discovers what is below her lonely and desolate home, she looks for a way to escape from the clutches of the witch, La Strega Bella, whose story is as interesting and carefully woven through that of Margherita’s story. Not only did this book take me back to my love of fairy tales but to my love of history and let me travel back to a world that I can now only access through the pages of history. Like Margherita, Charlotte-Rose is locked away and forgotten for many years. The novel’s historical fiction aspect is just as intriguing as its fairy tale aspect, and the conflict between Catholics and Huguenots in Renaissance France highlighted just how fragile and important our beliefs are to us, whatever they may be. Charlotte-Rose, a Huguenot, held onto her belief for as long as possible and was a very strong female character. I saw her as in control of her femininity and proud of it yet also determined to make the most of the society she was born into and become a part of it the way women of her stature were expected to. It was this combination that kept me reading this book, and not wanting to put it down at all. And when each part of one woman’s story ended on a cliffhanger, I was desperate to find out what happened, pushing my way eagerly and carefully through the next section so nothing went amiss. I won’t give away the ending but I will say that it is one of the best books incorporating history, romance, fairy tales and drama that I have ever read and was extremely well executed. I would give this five out of five stars, and definitely recommend it if you enjoy any of these genres or if you are just looking for something different by a wonderful Australian author to read. Is this Age Appropriate Reading? I adored this book too, but sadly, haven’t been able to get into any of Forsyth’s other books. She’s a great speaker though – I’ve heard her chat with Richard Fidler in Conversation a couple of times now.